Daniel Garber (Born 1880 – Died 1958) lived and worked in Lumberville, Pennsylvania, though he was born in Manchester, Indiana. At the turn of the century, his beautiful landscapes were considered to be the most distinctive work of the Pennsylvania Impressionists. His pursuit of a career as a professional artist began when he was 16 years old. He studied at the Art Academy of Cincinnati from 1897 to 1898. In 1897, he moved to Philadelphia and in 1899 he joined the Pennsylvania Academy of the Fine Arts. During the summers he also took classes at the Darby School of Painting in Fort Washington, Pennsylvania, studying under Thomas Anshutz and Hugh Breckenridge. In 1901, he opened a studio in Philadelphia where he worked as a commercial artist and portraitist. 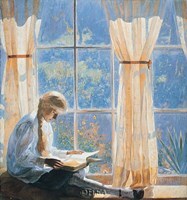 In 1905, due to the quality of his art, Garber won The Cresson Traveling Scholarship, a Pennsylvania Academy award, which allowed him to go to France, England and Italy for two years. The works of the French Impressionists such as those of Claude Monet and Camille Pissarro inspired him. The influence of thee European masters could clearly be seen in his works, and he developed a signature style combining realism and fantasy, and representing sunlight using a broad range of bright colors and pastel. In 1907, he returned to Lumberville, Pennsylvania, and the works he did here are perhaps some of his best. Garber painted in a luminous and straightforward manner, rendering branch and foliage patterns, as in Wilderness, and depicting the great scenes across the river in Byram he worked mainly in oil on canvas.